In the early 1840s, a young Canadian housemaid and a fellow servent were accused of murdering their employer and his housekeeper/mistress. Margaret Atwood turned the sensational story into a novel about the young accused murderess, Grace Marks. When the novel begins, Grace is 24 and has already been in prison for 8 years. Public opinion is divided as to her guilt or innocence, and she has been inconsistent in her recounting of the crimes. A young doctor who is interested in mental health and hopes to secure funding for a new modern asylum, begins interviewing Grace in hopes of getting her to tell him the real story. Through their conversation we are taken back to Grace's early life as she recounts her experiences. The story is told through Grace's first person narration as well as a third person perspective of Dr. Simon Jordan. Both are fascinating characters. Although they try to understand each other, it's clear that they never quite do. Every week Dr. Jordan brings an apple or root vegetable with him and puts it on the table between him and Grace because these items are stored in cellars, which is where the bodies the bodies were hidden, and he hopes to turn her thoughts and conversation towards the murders. He is unsuccessful in making his point clear though, and Grace always wonders why he asks her questions about vegetables. Though earnest, Dr. Jordan is a bit misguided and, as it turns out, rather weak in character. But he truly wants to help Grace. I really enjoyed watching his character develop throughout the book even though I didn't especially like where things went with him. I think I believed Grace to be innocent from the very start, probably because I found her so likable. She was very practical, down-to-earth and fond of folksy sayings like "ill words butter no parsnips" and "There is no use crying over spilt milk if you don't know whether the milk is spilt or not, and if God alone knew, then God alone could tidy it up if necessary." This woman lays it out on the line and isn't afraid to stick up for herself. But if you want to know whether or not she was guilty of the crimes, you'll have to read the book for yourself. The chapters of the book were grouped into sections and each section began with a number of quotations and excerpts. There was always a quote from Life in the Clearings by Susanna Moodie (1853), a book which contains her (questionable) observations about the case. Those excerpts were rather fascinating and her work was referred to in the novel. In addition to these excerpts, Atwood included bits of poetry and whatnot, the sort of thing which I always find to be just filler. Does anyone pay attention to those? I'm sure they are somehow supposed to relate to what's going on in that section, but by the time I start reading the text I've totally forgotten about all those quotes. I can't be alone in this. I was glad when my book group picked this to read because I had been wanting to read (or re-read) some Margaret Atwood. 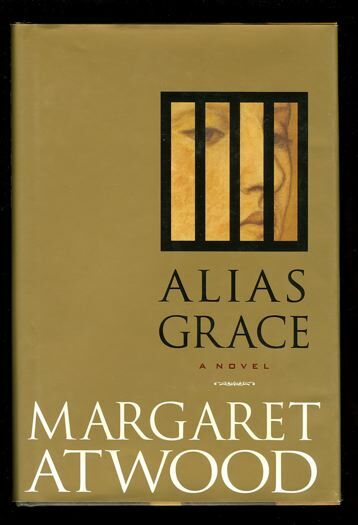 I read Alias Grace when it first came out, back when I was reading Atwood regularly. She hasn't written many novels recently, but the third book in the MaddAddam Trilogy is due out this fall so I'm thinking of starting Oryx and Crake and then continuing on to finish the series. I'd also like to read The Handmaid's Tale again, since I haven't read it since my early 20s. Either way, I see more Margaret Atwood in my future.